Antarctic rock-gods GWAR finally announced the ticket info for this year’s GWAR-B-Q, located at Hadad’s Water Park in Richmond, VA. This year sees the event entering its fourth consecutive year while offering its most bone-crushing line-up yet, setting the stage for what will certainly be the most massive GWAR-B-Q in the history of the human or any other race! There will be three levels of tickets sold and all tickets will be available ONLY on the GWAR-B-Q website. Premium $100 Ticket (Limited Quantity 150)- All day entry, official GWAR-B-Q t-shirt and VIP Pass for Meet & Greet signing with GWAR and possible chance to appear on stage with GWAR. TICKETS WILL GO ON SALE JUNE 6th! 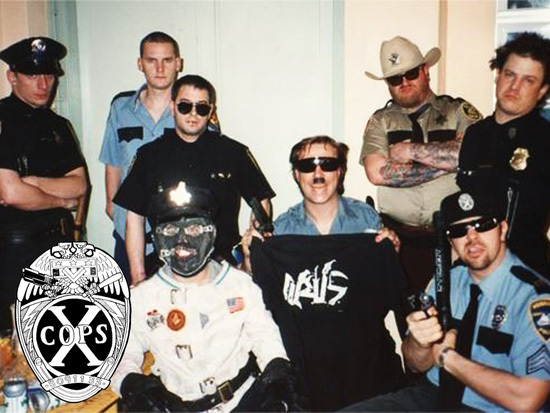 Today GWAR continues in their tradition of reuniting classic bands to play at the GWAR-B-Q, with the addition of the X-Cops! That’s right, the original lineup featuring Lt. Louie Scrapinetti (Mike Derks), Cadet Billy Club (Mike Dunn), Patrolman Cobb Knobbler (Dave Brockie), Sgt. Al Depantsia (Pete Lee), Sherriff Tubb Tucker (Casey Orr), Mountain Bike Officer Biff Buff (Brad Roberts), Sgt. Zypygski (Bob Gorman), and Detective Philip McRevis (Dave Musel) are reuniting for one night only at this year’s GWAR-B-Q! This will serve as the bands first show since 1996. GWAR-B-Q Tickets On Sale June 6. X-Cops Reunion Performance Confirmed! Three more bands have been added to the GWAR-B-Q lineup. Fresh off their tour with GWAR, Wilson and Warbeast will be making their first GWAR-B-Q appearance. Metal Blade Records artist Battlecross have been confirmed as well. Rumor has it that there are still huge special guests to be announced. Stay tuned to http://www.gwarbq.com for the latest info. 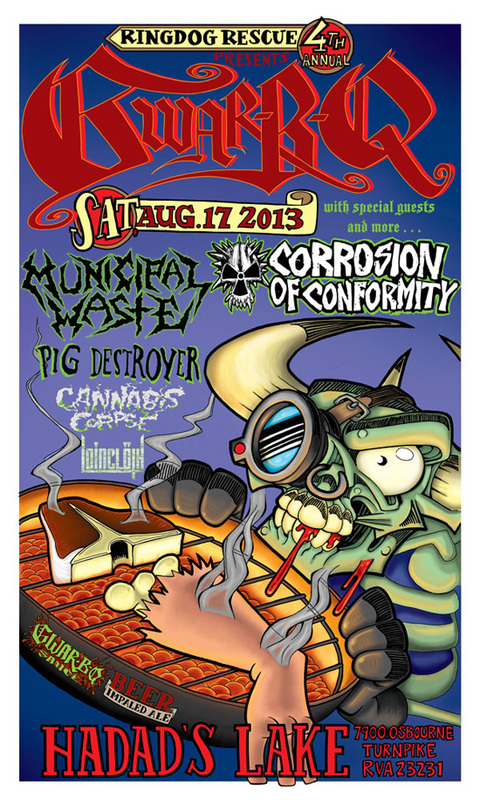 Already confirmed for the GWAR-B-Q are local favorites and international thrashers Municipal Waste will provide main support to the mighty GWAR, and in turn will be supported by a plethora of devastating acts like Corrosion of Conformity, Pig Destroyer, Cannabis Corpse, Loincloth, Kung-Fu Dykes and many more. Once again Hadad’s will host not one but TWO stages which will be packed with bands all day…and finally there are rumors of a yet-to-be-announced act that will put this year’s GWAR-B-Q 2013 completely over the top! The event is scheduled to take place Saturday August 17, 2013 at Hadad’s Water Park in Richmond, VA, located at 7900 Osbourne Turnpike. Doors will open at 10:00 AM and the first band will hit the stage at 11:00 AM. For more information be sure to visit: http://gwarbq.com/. This entry was posted in METAL and tagged bob gorman, Cannabis Corpse, casey orr, Corrosion of Conformity, Dave Brockie, Gwar, GWAR-B-Q, Hadad's Lake, Hadad's Water Park, Kung-Fu Dykes, Loincloth, Metal Blade Records, mike derks, Municipal Waste, Oderus Urungus, Pig Destroyer, Richmond Virginia, Rigor Mortis, WARBEAST, Westboro Baptist Church, Wilson, X-Cops, You Have The Right To Remain Silent.... Bookmark the permalink.